SCANNER ONLY, 1D Laser. Cables and accessories must be purchased separately. Color: Black. For the full Kit purchase (Part# LS2208-SR20007R-NA). SCANNER ONLY, 1D Laser. Cables and accessories must be purchased separately. Color: White. For the full Kit purchase (Part# LS2208-SR20001R-NA). USB Kit, 1D Laser. Includes USB cable and stand. Color: Black. USB Kit. 1D Laser. Includes USB cable and stand. Color: White. Replaces (Part# LS2208-SR20001R-UR). 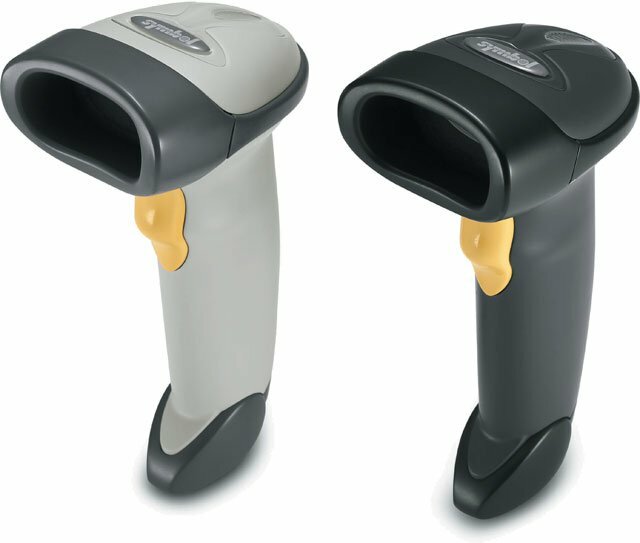 In the world of laser barcode scanners the LS2208 is the industry leader due to its high performance at an affordable cost. With an aggressive laser scan engine it can read any linear (1D) barcode which makes it a great scanner for retail environments where daily scanning is needed. 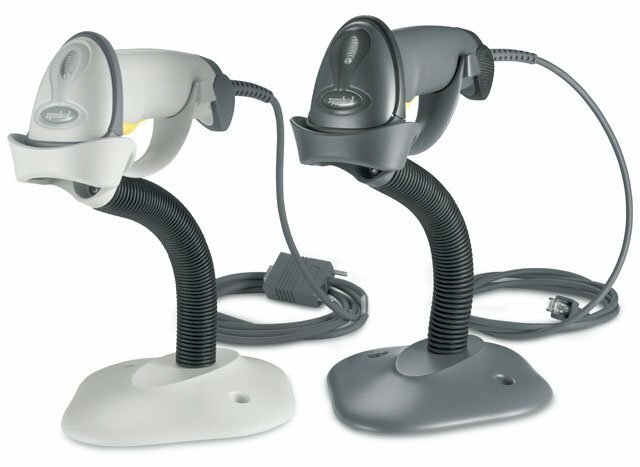 When compared to lower cost CCD barcode scanners the LS2208 will scan quicker, at a farther range, and with a 5 year warranty (for NEW scanners only) out live the competition. If a rugged warehouse device is needed the Motorola LS3408FZ would be a better fit but at the LS2208 price point you can easily deploy multiple units at once with back-up units on hand. Being able to easily interfaces with any PC/software, the LS2208 will be up and running in minutes from opening the box. Use in our quilt shop. Didn't know scanners wore out! I'm learning to include barcodes in my MS Access database. My son has helped my to understand just what the scanner does. He said"Just think of it as an instant keyboard to input with." My other son said "This is cool, I could make a barcoded list of my passwords!" This scanner won't work with just any barcode font though, you have to do some experimenting. I found a font at BarcodeWiz that worked though they charge. We have 40 deployed and functioning well but starting in 2015 this model no longer functions with our equipment's wand connection and the wand emulation cable. The next Symbol model that does is more than double the price. That leaves us scrambling for old stock to be able to continue to support the ones in use and then searching for reasonable replacement. I purchased three of these for our warehouse. So far no problems but it's only been a couple of weeks. We'll see how they hold up in the dusty warehouse. During the course of business with my square register. I do travel with my iPad Air and am disappointed that there needs to be a power supply hooked up to electricity for this unit to work which is NOT the problem of the bar code unit it is that square didn't take into effect to allow it to run on the power of the iPad through the stand. For our particular application this was a no brainer as far as simplicity and ease-of-use. We use this product to manage our inventory. It arrived on time and was easy to program and use. For my application/use this is a great product. The items were as ordered, advice on changes or orders was helpful and returns were straightforward. Best scanner for our needs. We love this scanner for the purpose we use it for. We are a job shop that manufactures precision machined parts and sheet metal parts. We have several of these scanners throughout our entire plant. We use them to track jobs as they are scanned through each department. This scanner is very durable and lasts a long time. See "Pros and Cons" for comments. I bought several of the these scanners for library book check out, textbook distribution to students and inventory. Everyone is pleased with these sturdy devices because they continue to perform under high use. We use the scanner primarily to scan Ups, Fedex, DHL and postal shipping drop offs. Works great! We rent tuxedos and most of our inventory is barcoded so we have control and tracking ability. This scanner was the third one I ever bought for the business and the best and your online equipment manual helped us to print out the type of barcode we use and it became effective immediately, unlike other ones we'd had. IF you need a cheap scanner that you need to program some prefix and sufix on it does not get much better than these. Its reliable, simple to set up, and easy to use. If a mobile scanner isn't necessary this is a very affordable alternative. Perfect for day to day task at our company. Ready to use out of the box and reads really fast. Performance at a great price! We were looking for a simple scanner to use at our store and the LS2208 really works in any situation we need. Keeps our checkout lines shorter since it is so quick. use in a medical lab to scan incoming samples. easy to install, easy to use. and, it looks cool! We are trying out scanners to enter attendance into database. So far we have found these easy to use. We use these scanner at our two hardware stores they are reliable and easy to set up, I get an average usage of 4 years under heavy use out of one. This Scanner has been the standard in our retail locations for the past 15 years. Durable, easy to program and reliable. My company needed a solution for inventory and we chose to go with Barcodes. We needed a fast reader and the Customer Service team recommended this reader and we could not be happier. Out of the box, this reader was ready to go. The Scanner read barcode accurately. I tried many different scanners, but none of them are accurate as the scanner. We have used these products for years in our inventory and shipping department. They accurately scan our product labels into our shipping and ERP solution. We use it to receive and issue materials electronically. Eliminated manual entry errors. We bought this to implement barcode receiving at our warehouse. It worked so well we bought two more for our shipping dept. This the only model I saw that comes with a stand for stationary use. The only complaint is that it doesn't come with the factory manual which has a large amount of customizing instructions. However Barcodes Inc. was able to supply the link to the PDF so I was able to get what I needed. Overall great product and great service. Scans everything instantly! Love this scanner! I am currently using this product in our school library to catalogue our entire inventory. It scans publisher barcodes as well as ones I print off onto labels.